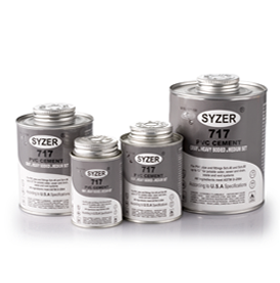 SYZER is aci’s 714, 700, and 717 specifications brand of solvent cements available in the Middle East. It is our second line of solvent cements that comes with statements that are slightly different from other brand names. Named after the famous SYZER MAGIC, it certainly lives up to the quality and economic reputation. It is used for PVC, CPVC & UPVC pipes and fittings for water supply, drain, sewage and waste piping systems and meets American standards ASTM. Being one of the most trusted names in the industry, we have been able to serve our valued clients with a wide range of Solvent Cements. 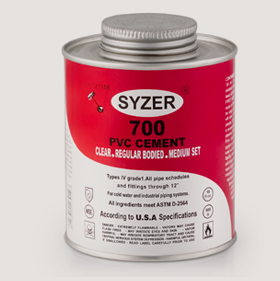 SYZER products offered by aci are highly demanded in the market for their excellent adhesive strength and easy application. SYZER has seized a good portion of the local market in Egypt and is now a favored brand among a lot of clients. 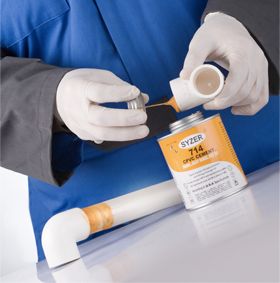 Clear, regular bodied, medium set PVC solvent cement for all classes and schedules with interference fit through 12” for cold water and industrial piping systems. High-strength formula for industrial, irrigation, DWV, electrical conduit, pool & spa and plumbing, including PVC foam core pipe. Heavy bodied, fast setting CPVC solvent cement (Orange) for welding CPVC pipes and fittings. Specially formulated for use in residential and commercial cold and hot water CPVC piping systems up to 180°F (82°C). Meets American Standards ASTM D-2846 & F-493. Grey, heavy bodied, medium set PVC and CPVC solvent cement. It is specially formulated for plumbing, irrigation, pool & spa, conduit, sewer, drain, waste and vent piping systems. It has good gap filling properties and its medium set allows more working time in warm weather. Sanitary products importers and traders. Manufacturers and traders of PVC & CPVC pipes.